Definition at line 37 of file AMDGPURegisterBankInfo.h. Definition at line 36 of file AMDGPURegisterBankInfo.cpp. Since register banks may cover different size, Size specifies what will be the size in bits that will be copied around. Since this is a copy, both registers have the same size. Definition at line 57 of file AMDGPURegisterBankInfo.cpp. References llvm::RegisterBankInfo::copyCost(), llvm::RegisterBank::getID(), and llvm::max(). This is similar to copyCost, except for cases where multiple copy-like operations need to be inserted. 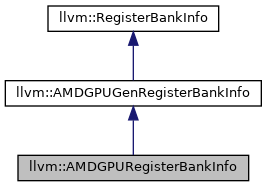 If the register is used as a source operand and already has a bank assigned, CurBank is non-null. Definition at line 80 of file AMDGPURegisterBankInfo.cpp. References assert(), llvm::RegisterBankInfo::ValueMapping::BreakDown, llvm::RegisterBankInfo::PartialMapping::Length, llvm::RegisterBankInfo::ValueMapping::NumBreakDowns, llvm::RegisterBankInfo::PartialMapping::RegBank, and llvm::RegisterBankInfo::PartialMapping::StartIdx. Alternative in the sense different from getInstrMapping. Definition at line 109 of file AMDGPURegisterBankInfo.cpp. References llvm::MachineInstrBuilder::addDef(), llvm::MachineInstrBuilder::addUse(), assert(), B, llvm::MachineIRBuilder::buildInstr(), llvm::MachineRegisterInfo::createGenericVirtualRegister(), llvm::RegisterBankInfo::getInstrAlternativeMappings(), llvm::RegisterBankInfo::getInstructionMapping(), llvm::MachineIRBuilder::getMRI(), llvm::MachineInstr::getOpcode(), llvm::MachineInstr::getOperand(), llvm::RegisterBankInfo::getOperandsMapping(), llvm::MachineBasicBlock::getParent(), llvm::MachineInstr::getParent(), llvm::MachineOperand::getReg(), llvm::RegisterBankInfo::getRegBank(), llvm::MachineFunction::getRegInfo(), llvm::LLT::getSizeInBits(), llvm::getSizeInBits(), llvm::MachineRegisterInfo::getType(), getValueMapping(), MRI, llvm::SmallVectorTemplateBase< T, bool >::push_back(), Reg, and Size. This function must return a legal mapping, because AMDGPURegisterBankInfo::getInstrAlternativeMappings() is not called in RegBankSelect::Mode::Fast. Any mapping that would cause a VGPR to SGPR generated is illegal. Definition at line 753 of file AMDGPURegisterBankInfo.cpp. References assert(), llvm::RegisterBankInfo::getInstrMappingImpl(), llvm::RegisterBankInfo::getInstructionMapping(), llvm::MachineOperand::getIntrinsicID(), llvm::RegisterBankInfo::getInvalidInstructionMapping(), llvm::MachineInstr::getNumOperands(), llvm::MachineInstr::getOpcode(), llvm::MachineInstr::getOperand(), llvm::RegisterBankInfo::getOperandsMapping(), llvm::MachineBasicBlock::getParent(), llvm::MachineInstr::getParent(), llvm::MachineOperand::getReg(), llvm::MachineFunction::getRegInfo(), llvm::getSizeInBits(), llvm::MachineRegisterInfo::getType(), getValueMapping(), llvm::MachineOperand::isReg(), llvm::RegisterBankInfo::InstructionMapping::isValid(), LLVM_FALLTHROUGH, llvm::maxnum(), llvm::minnum(), MRI, and Size. Definition at line 99 of file AMDGPURegisterBankInfo.cpp.